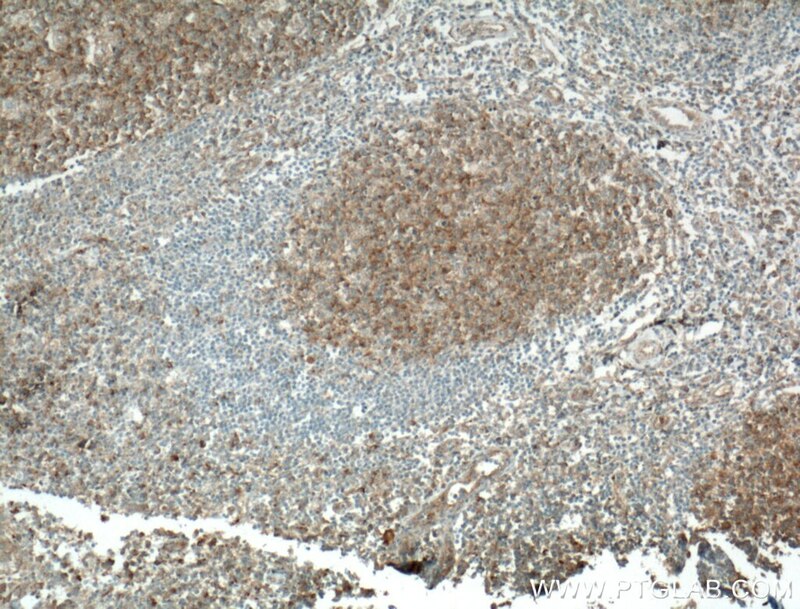 Immunohistochemical analysis of paraffin-embedded human tonsillitis tissue slide using 66502-1-Ig (CD40L/CD154 antibody) at dilution of 1:400 (under 10x lens) heat mediated antigen retrieved with Tris-EDTA buffer(pH9). 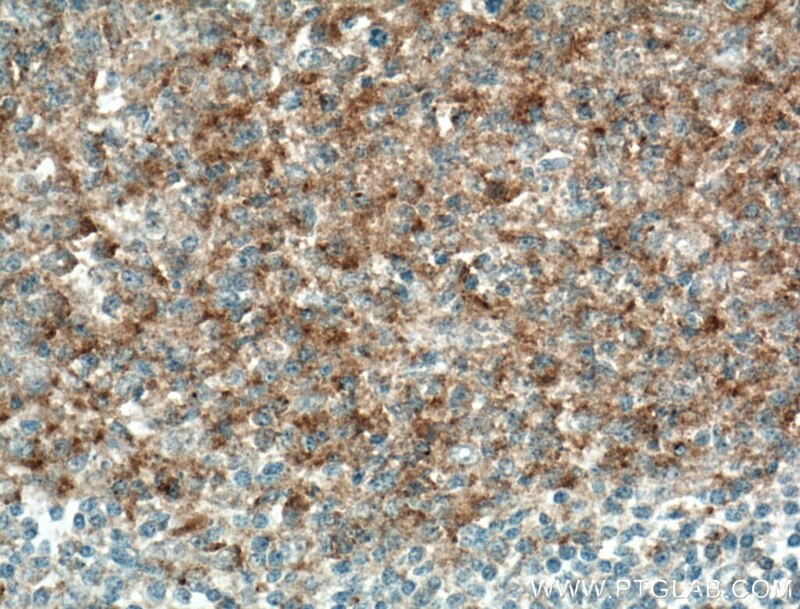 Immunohistochemical analysis of paraffin-embedded human tonsillitis tissue slide using 66502-1-Ig (CD40L/CD154 antibody) at dilution of 1:400 (under 40x lens) heat mediated antigen retrieved with Tris-EDTA buffer(pH9). The CD40 ligand (CD40L, TRAP, CD154), a member of the TNF superfamily of ligands, is expressed as either a 33-kd transmembrane homologue or 18-kd soluble form (sCD154). CD40L is primarily expressed on activated CD4+ T cells and on a small proportion of CD8+ T cells and platelets. It binds to CD40 on antigen-presenting cells (APC), which leads to many effects depending on the target cell type. Recent studies have suggested that CD40/CD40L interactions regulate oxidative stress and affect various signaling pathways in both the immunological and the cardiovascular systems. The CD40/CD40L system is also involved in tumorigenesis. Its expression is tightly regulated, and abnormal levels of CD40L are associated with the pathogenesis of atheromatous plaque destabilization and thrombotic events. Multiple mutations in CD40LG gene have been identified that are associated with hyper-IgM immunodeficiency syndrome type 1.